Michael Roy, Green Entertainer Creates Expensive Shirt & Tie! No cards, coins, or twisted balloons, only a paper square and the finesse of a close-up magician, Michael Roy, Folder Fantastique, brings the magic to event guests with colorful creations of exquisite artistry, elegantly executed right before their eyes. Without missing a crease, Michael Roy simultaneously transforms an uncut sheet into 3D animal caricatures while keeping guests amused with a nonstop stream of witty repartee and useless (yet strangely fascinating) information, revealing secrets and history of folding art. 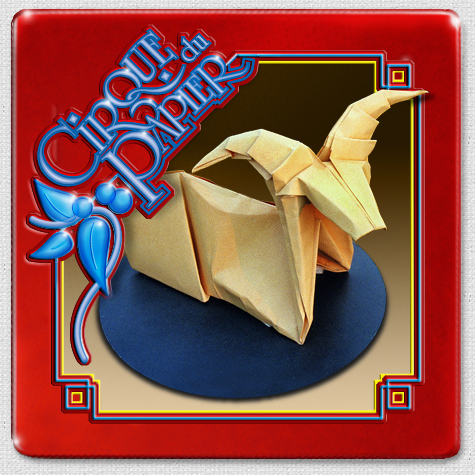 Not your grade school teacher's origami, Michael Roy's Cirque du Papier is a mind bending paper folding experience. Guests go home with an artful remembrance and keepsake! Thank you so much for your visiting our school!. Your performance was unique and fun and had many exciting surprises for the students. The upper grades really enjoyed making their own pieces and, like I expected, that led to quite a few students wanting to check out origami books from our library. I asked the kids this week what they thought of your visit and I got many "awesomes"! One student was very impressed with how fast you could "rap!" Your visit was the perfect ending to our Right to Read Week celebration. Michael captivated the room with his wit, humor, and amazing talent of Cirque du Papier! Adults and teenagers alike were in awe of his talent which he performed with such grace and professionalism. Never before had I seen him, just took a chance from his website and I am sure to hire him again! Michael and his team did an excellent job at our recent corporate event. All of our guests were amazed at Michael's origami skills. Plus they all have a special memento from the evening. Thank you, Michael, for bringing your unique talents and artistry to our event! Paper folding and comic timing extraordinaire! I booked Michael Roy Baldridge as a closing act for a local school's Right to Read week in March, 2016. Michael thoroughly engaged the audience of 1st to 4th graders with his paper crafting, stage presence and comic timing. Both the teachers and the students were blown away by Michael's alliterative opening. One teacher asked me if he was a poet! We had Michael do origami beside our table at our campus-wide involvement fair. The whole freshman class and many upperclassmen (upwards of 400 people) were there and everyone was excited and enthralled when passing by to see Michael at work. There was always a line of people throughout the entire three hours who wanted to get their very own origami animal. Michael was very sociable to all who came by and always engaged in conversation with those waiting in line. With all of our campus organizations and clubs and many community partners present, there was a lot for students to take in, but many of them stayed by our table for a noticeably longer time because they were so engaged and interested with the origami being done right in front of them. Michael provided origami animals to as many students as he could throughout the whole time of the fair, but just as many would have loved if he could have stayed longer so they could get their very own. Throughout the event, students were already asking if we would be bringing him back. We were beyond pleased with Michael's work and wish he could have stayed even longer. Perfect for all ages and our animal theme birthday party! Michael set up his eye-catching display of origami artistry near the entrance to the conservatory, where our animal theme birthday party took place. As the party unfolded, Michael started folding and he presented a stunning origami animal to each guest! And throughout the party, I'd look over to find yet another group of intrigued children (and adults) clustered around his display, asking him questions and watching him work. So many guests had the same question: "where did you find Michael Roy?!" - and everywhere I went in the room I found kids playing with his amazing creations, holding onto them like treasured friends. The hotel's event captain mentioned that she was really delighted with his manner in interacting with the children, who ranged from ages 2 to 11. All of us loved it! Even the adults joined in the workshop, which was fabulous! We had a few guests over at our house after the party, and a couple of them delicately brought out the impressive pieces he'd given them for all of us to admire. What can I say, he was a hit! U coordinate the multi-cultural Arts Day programming at St. Gabriel's School in Concord, OH. We booked Michael for our Arts Day in October to present on Origami as part of our Asian culture series & he did not disappoint! He presented to nearly 800 children throughout the day (we had six sessions)--he was professional, flexible, and very entertaining! The children range in age from 5-14 and he found a way to tailor the program to each level--and even the adults in the room were highly engaged! 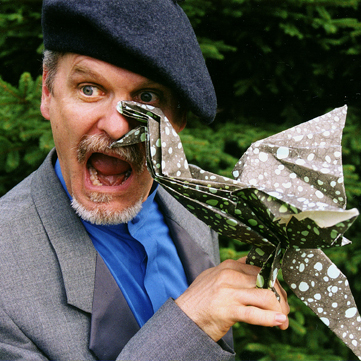 The way he presents is entertaining for children, but he includes plenty of references and humor that are geared toward adults--plus the large scale of his origami is perfect for a larger group. We had no concerns and felt that the program was both educational and entertaining--not an easy task! Michael performed for my crowd of 200+ top executives and he the hit of the event! Very professional, flexible and truly enjoyable to work with. He is first class all the way. Thanks again Michael sure hope to have the opportunity to work with you again..
Michael was a ton of fun! he arrived on time, was completely prepared and ready by the time guests arrived--and put on a GREAT show! I had a group of young boys who normally have an attention span of 10 minutes--he kept them for well over an hour with hands on activity, juggling and other jokes, demonstration and each guest received a specialized animal favor! He had an incredible display to show before and after which even adults were amazed! I would highly recommend Michael for your event as it was unique, fun and something to talk about! Great guy great service! My daughter, Maya, loved Michael's workshop as did so many of the students. I have had many wonderful words from the adult volunteers as well! Maya keeps telling everyone how he rhymed at the beginning "forever and ever.... like 500 words!". • Interacts with event guests in small clusters, one-on-one or table-side, performing paper folding close-up. Guests keep pieces created. • A self-standing "MicRo Gallery" of origami art which is an attraction in itself, as well as a way to give guests suggestions of what folded art keepsakes he can create for them. • Engages individuals in interactive games and puzzles as a way to "win" more advanced pieces. Can entertain at the MicRo Gallery and/or stroll throughout. - Informal origami lessons for interested guests. • Michael Roy begins with a 25 - 30 minute stand-up origami presentation. • This is followed by a 60 minutes hands-on origami workshop, teaching a simple, fun origami design. 30 or 45 minutes workshops are also available. • Interacting with event guests in small clusters, one-on-one, performing paper folding close-up. The guests keep the pieces created. • Origami "workshop" or informal "lessons". Are your event guests suffering from the BTDTs (Been There Done That Syndrome)? Enjoyed all they can stand of balloon ("pop") art? Heard "pick a card" one too many times? Noticing how old they look in the latest caricature in their collection? Simply tired of the same ol' same ol'? Well, it could be time for something completely different! One Square of Paper, Magical Possibilities! An Elegant International Entertainer Keeping Crowds Captivated Executing Expressive Eloquent Utterances and Quoting Copious Quick Quips while Kinetically Conjuring A Colorful Carnival Caravan of Crazy Cool Crisp, Creatively Complex, Cleverly Constructed, Exclusively Crease-Crafted, Exquisite Quality Converted Quadrilateral Creature Caricature Keepsakes Close-up! Incontrovertibly Copacetic! Not your grade school teacher's origami! 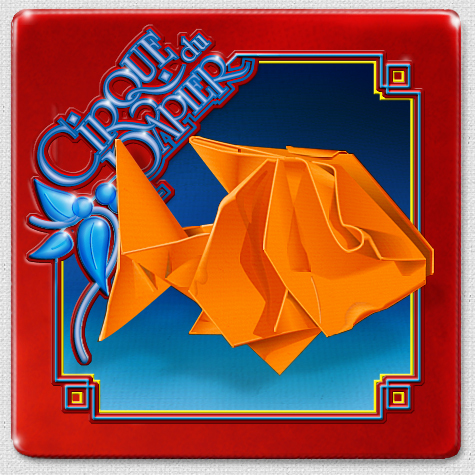 Cirque du Papier is a mind-bending, paper-folding, your-world-ain’t-flat-no-more experience. Meandering event guests discover Folder Fantastique, Michael Roy Baldridge deftly displaying dazzling digital dexterity, morphing single flat squares of paper into 3D creatures by mere folding. No cuts. No tears. No glue. And no table! Without missing a crease, Michael Roy simultaneously (and at the same time!) 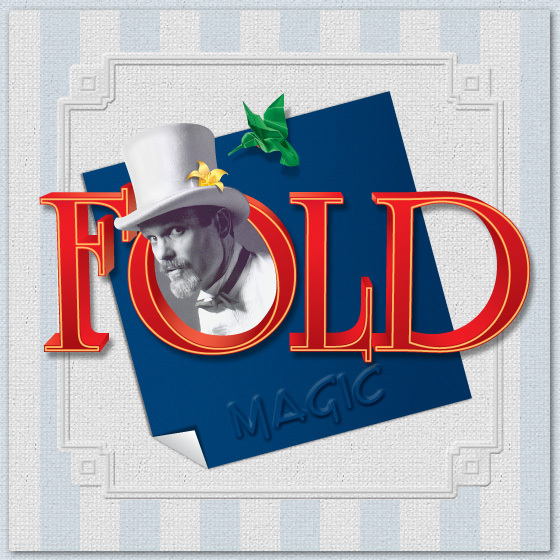 keeps guests amused with a nonstop stream of offbeat witty repartee and useless (yet strangely fascinating) information, revealing the secrets and history of folding art. Guests marvel as Michael Roy works magic, with amazing manipulations, quick wit, and cool “transformers”. Whether hanging out with guests at his MicRo Gallery of Origami Art or mingling among event guests, Cirque du Papier with Michael Roy, Folder Fantastique is appropriate wherever fine and fun close-up entertainment is needed. From high-end events to small parties to festivals, the fine art of entertainment for the discerning. 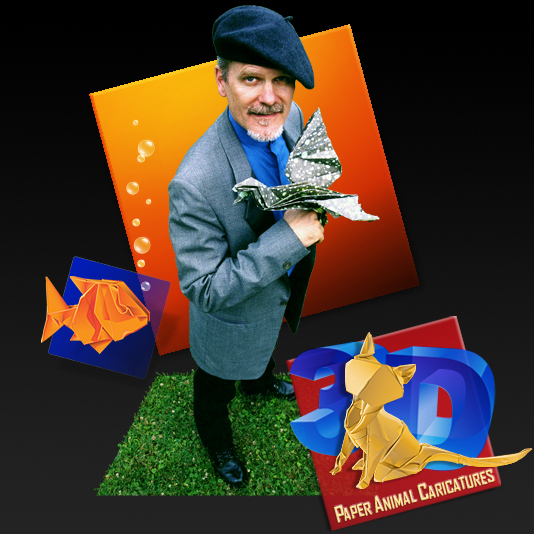 Michael Roy Baldridge -- Strolling Origami Entertainer, Visual Artist, and Juggler -- started out life in the foothills of eastern KY at a very young age. He quickly grew out of that (well, actually . . . not so much), and in 1975 at the age of 20, he left for San Diego, CA where he worked as a graphic artist, illustrator, and juggler for the acclaimed theatre company Lamb's Players. During those years he met and developed stage productions with Armando and Richard Turner as well as street performing in Balboa Park. Within three years he was doing solo stage and television work in the southern California region. In 1980 he moved with his wife Diane to Aurora, Ohio and later to Kent, Ohio where they raised their sons Tyler and Dylan. With Kent as their home base, the whole family went on the road touring across the United States and by 1985 Michael Roy Baldridge was traveling the world with a 90 minute one-man theatre show featuring choreographed juggling, a silent movie with contemporary music, origami, visual art, and humor. Throughout the years Michael Roy has done appearances in a wide range of venues and shared the stage with a variety of artists. He has appeared on 92 Air Force bases in the United States, Creation Music Festival in Pennsylvania, school assembly programs and colleges from Massachusetts to San Diego, and stage appearances with Taiwan's top TV and Pop Stars as well as Armando and Gold Finger & Dove at Woozland Amusement Park in Tainan, Taiwan. He has shared the stage with The Flying Karamazov Brothers, Avner the Eccentric, and Ricky Skaggs as well as veteran juggler and comedy entertainer Whitey Roberts and Irish Folk Singer Robin Rich. He even opened for Victor The Wrestling Bear in Grand Rapids, Michigan (Baldridge considers that a highlight in his illustrious career . . OK, at least memorable)! Michael Roy Baldridge also has taught object manipulation classes, workshops, and seminars throughout the United States including Richmond Shepard's Mime School in Hollywood, California. Michael Roy Baldridge's own education has been varied: studying ballet, modern dance, mime, and acting with private teachers and in college in the San Diego area. He studied commercial art at Art Instruction Schools, Minneapolis, Minnesota and visual art, design, desktop publishing, and web design at the Cleveland Institute of Art. He has studied juggling through years of self training and informally with many jugglers including Peter Davison and Jon Held (of Air Jazz fame), and Kit Summers. Baldridge studied origami via books, self training, experimentation, and from a cute waitress at a chinese buffet. In 1997 he finally dropped the road life and acquired a real job as graphic artist. Now his "repertoire" includes strolling and close-up and origami entertainment, graphic design, illustration, humor, and the best popcorn treat and tastiest and healthiest burritos you’ll ever eat. Oh yes, and at the drop of a hat you can still get him to juggle (the hat). SPACE: The “footprint” of the Micro Gallery, (including satchels, and game chair) is approximately 5 ft X 5.5 ft. To accommodate guests’ enjoyment of Michael Roy’s MicRo Gallery please provide a total of approximately 10ft X 10ft of well lighted floor space (that includes the Gallery). Less space is possible. Michael Roy can make adjustments as needed. If room is dimmed during appearance, Michael can provide a 9’ Market Umbrella with lighting system (*add 30 minutes to load-in & set-up and tear-down & load-out time). WATER: Drinking water is always helpful. CHAIRS: Providing 2 - 4 chairs can help create a relaxed setting for guests. NOTE: The MicRo Gallery is self-standing and Michael does not need a table. COVER: For outdoor open-air settings, please provide a 10 ft X 10 ft canopy tent. If that cannot be provided please let Michael Roy know. NOTE: In all close-up / interactive settings Michael Roy can stroll throughout the venue, entertaining tableside, etc. as needed. In some settings Michael Roy does not set up the MicRo Gallery. He simply finds a spot to park his satchels of paper, etc. and roams throughout the venue. Please contact Michael to discuss. Michael Roy will arrive approximately 60 minutes prior to appearance (90* minutes if using umbrella or in larger settings such as festivals, etc.). NOTE: Michael’s MicRo Gallery, etc. takes up most of the room in his “Foldsmobile”. Please arrange for vehicle access as close to location of appearance as possible. Typically takes 60 minutes (90* minutes if using umbrella or in larger settings such as festivals, etc.). NOTE: Michael’s MicRo Gallery, etc. takes up most of the room in his “Foldsmobile”. Please arrange for vehicle access as close to location of appearance as possible. Close-up / Interactive Settings -- Approximately 10ft X 10ft of well lighted space for Michael Roy’s MicRo Gallery and for interaction with guests. Less space is possible. Michael Roy can make adjustments as needed. Please contact Michael to discuss. Stand-up / Hands-on Workshop Settings -- Standard 6ft or 8ft retangular banquet tables are best, arranged in a “U” shape. Michael Roy will set-up his cases, etc. and present from the top (open end) of the “U”. Load-in & Set-up Time (either setting) -- Michael Roy will arrive approximately 60 minutes prior to appearance for load-in and set-up. Tear-down & Load-out Time (either setting) -- Typically takes 60 minutes. Thank you Michael for an extravagant evening filled with amazing folding! Every guest from 4 years old to 80 years old found awe and amazement in your abilities. It was a pleasure working with you again at the Ingenuity Festival. Thanks for all your hard work and for helping to make Ingenuity the success it was! My daughter and I are going to get a-hold of some origami paper - we were inspired! Michael Roy made it look so easy. His display was very enchanting; a family of penguins here, a beautifully sculpted horse there. It was topped off with a delicate, peaceful dove. On his beret? A whimsical, orange, goldfish. In reality, origami is a science of valley folds, mountain folds and inverse folds. Michael attempted to teach this delicate art to 18 Library patrons. Luckily, I was one of them. I was just going to watch, but couldn’t resist trying what Michael was teaching. He passed beautifully colored sheets of paper around the table. I was hooked. I didn’t even know what we were going to make. It didn’t matter. First, using the basic folds, we made a simple bird. My confidence began to grow. Next, Michael announced we were all going to make penguins. He held up an example. Everyone was excited. Secretly I wondered if we could do it. Penguins looked hard. But, we all started at the same spot and one fold after another our penguins began to look pretty good. It’s been longer than two weeks and my penguin is still sitting here on my desk. As we left that night we all had something in common besides a small black and white penguin. We had a feeling of accomplishment. We enjoyed having you at the Zoo. Your talent is very unique and it is not something you see often. Kids seemed to love it, which makes it a great fit for our audience. We would love to have you back at the Zoo sometime in the future. We have a lot of events happening this year and I am confident we will be able to find a time for you to come back. Thank you so much for everything Saturday night! The centerpieces turned out beautifully and everyone enjoyed interacting with you at the event. Great Job! Client loved you! [Shoreby Club • Bratenahl, Ohio: Social Harborfest Party - Adult Dinner Dance] Here's a special bonus + tip from client! I think everyone enjoyed you being on-board with us Saturday night [for college grad party]. Thank you for making special gifts for each person and for my earrings. Again thank you for your performance. We all enjoyed it very much! We would like to thank you for your outstanding performance and creative animals that everyone enjoyed at our Portage Animal Protection League Fair. Everyone stopped in to see you and enjoyed taking home an "animal" for their future enjoyment. Your booth was like a magnet that drew people of all ages. We sincerely hope you will be available to help our event be even more successful next year. I speak for the entire board and committee -- thank you.